It was the Northwest Ordinance of 1787 that gave birth to the idea of having state-funded education systems. It kick-started with the establishment of Ohio University in 1804 and has today developed into what we know as state universities. 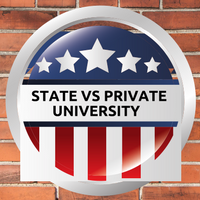 State universities are funded by the governments of the respective states and are public varsities. They are large state schools that offer undergraduate and graduate programs, and often cater to military personnel and government employees. These universities have a single administration but may have several institutions under its ambit - something like that of the universities of California and Texas - or, maybe one large entity spread across acres, nearly resembling a township. A state university is typically funded by the state government. At least 90% is publicly funded, unlike a private university that has its bank of philanthropists and resources. The annual total cost (including boarding and tuition for in-state students) for full-time undergraduate courses at public universities in 2016 was about $21,000, while that of private institutions was $37,000. State universities are strictly run by state regulations. The syllabus is standardized across all state-run schools and students are taught through collaborative sessions. Unlike the academic mollycoddling that students of private universities enjoy, those of state universities are often required to delve deeper into the subject on their own. This means absolute self-motivation to excel. Being dedicated to the public, a state university offers one of the most affordable education with most students not requiring any financial aid. Some state universities are so large that they have at least 40,000 students on campus at a time. With a wide range of student bodies, some running into thousands, these campuses are eternally bustling with activity. With students from across geographies, ethnicity, socio-economic backgrounds, physical challenges, sexual differences and much more looking at state universities for affordable and quality education, these campuses are possibly the perfect place for diverse social interaction and holistic development. They are tiny little-mixed pots of culture - a mini world in themselves. Many state universities house at least ten libraries that hold millions of books from floor to ceiling. This makes them perfect houses of education where students are given the opportunity to explore, research and seek knowledge on their accord. State universities are a blessing for those who wish to work and earn. Since most state universities are situated within the urban limits, students can work at nearby places or on-campus and attend college too with little time wasted on commuting. State universities also offer flexible study hours and lots of classes to choose from which is another advantage for those who need to earn while learning. Loyalty and the fire of student spirit is kept alive in state universities. With large student bodies to be a part of and a horde of activities to choose from - ranging from athletics to debates - students of state universities enjoy a wholesome academic experience. State universities hire scholars of repute to tutor their vast student body. Hence, the fear that state universities may compromise on the quality of education is put to rest. A state university educates not a few thousand students, but tens of thousands. Hence, students cannot expect too much of individual nurturing from tutors. Therefore, every student needs to motivate himself/herself to learn in-depth about every subject and maintain a good personal rapport with professors. It takes patience to deal with administrative concerns in bodies as large as state universities. It's best to be quick in registering for classes as slots may fill up quickly due to the sheer number of students. Extensive classroom involvement during lectures can help vast knowledge exchange. Students have a horde of activity clubs to choose from to hone their skills. This makes it a perfect place for doing all that they enjoy doing - study and play. State universities earn subsidies from their federal governments, which differs from state to state. Since they offer low tuition fee, most students rarely need funding. However, these universities offer several scholarships for meritorious students and various financial aids for those in need. Why USA? Pros and cons.